Slow nocturnal hemodialysis (SNHD) or daily hemodialysis is a new, emerging alternate method for treating patients with end stage renal disease (ESRD). This treatment modality was pioneered by Wellesley Hospital, Fresenius Medical Care Canada and Cybernius Medical Ltd. in Toronto, Canada and has been in use on a moderate scale at other sites in North America since 1996.
cybeREN provides a collection of treatment data remotely, i.e. from the patients home. This provides levels of clinical/treatment information which is on a par with data available from in-center hemodialysis treatment. A complete record of each treatment is kept, complete with time on/off and 30 minute snapshots. 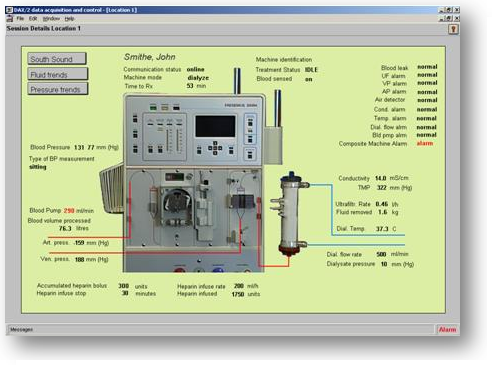 This enables determination of compliance with the hemodialysis prescription, problems with the machine through alarm registration and statistical evaluations and comparisons of aggregate treatment data collected over time. The collected data may also server as a basis for future billing / treatment quality assurance. cyberREN provides remote real-time monitoring of the treatment by a central observer. CML offers a very sophisticated dialysis process visualization system, that allows an observer to display an overview of all daily or nightly dialysis treatments that are being conducted on a city, region or even nationally. The observer is notified visually and acoustically of all exception conditions, and can drill down to determine individual patient problems, or the dialysis trends leading up to the exception. Patient feel secure knowing that an experienced, well informed observer is indeed providing for their treatment safety.